We’re accustomed to thinking of dinosaurs on Jurassic floodplains or in Cretaceous jungles. But dinosaurs lived all over the world, and the ancient continents boasted a variety of different ecosystems. Dinosaurs adapted to these surroundings, and lived in environments that we don’t often associate with the Mesozoic. It’s easy to think of paleontologists digging in deserts because that’s where rock is easily exposed, but dinosaurs lived in deserts too. The Gobi Desert in modern Mongolia was a desert during the Cretaceous period too, and many of the breathtaking, near-complete fossil discoveries made there are due to dinosaurs being trapped beneath sand dunes or caught in sandstorms. The sandstone preserves their remains and paleontologists liberate the beasts from the habitat they called home. And it was home–dinosaurs evolved methods of coping with desert extremes, just as animals do today. Did they stay out of the heat of the day and operate, at least a bit, at night? Did they have special anatomical features not preserved in the skeleton that helped them deal with extreme temperatures? The answers to these questions and many others lay buried in the stones. But birds and a range of “cold-blooded” dinosaur relatives live in deserts today so perhaps it doesn’t seem too big a stretch to think of dinosaurs eking out an existence in the blazing sun and shifting sands. But what about the other extreme? The polar regions were different during the Mesozoic. Continents were in different positions and the greenhouse effect was in outrageous overdrive–ensuring much higher temperatures. Today’s Antarctic and Arctic regions were home to great forests. 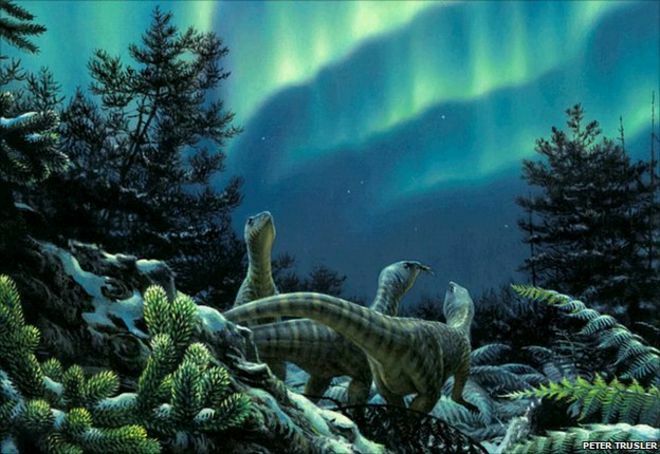 Dinosaurs who lived in these areas–and they have been found in Alaska and Antarctica–faced months of darkness and likely snowstorms and colder temperatures, even if they weren’t as cold as today’s poles. So don’t think of dinosaurs as reptiles playing it safe in the swamp. Think of them as pushing themselves to Earth’s extremes–and the range of birds that call the deserts and the icy regions home today continue the tradition. Share your favorite paleo-art of dinosaurs at the extremes with us on Facebook and Twitter using the hashtag #TDIDinos.